Are you looking for a complete course in Brazilian Portuguese which takes you effortlessly from beginner to confident speaker? 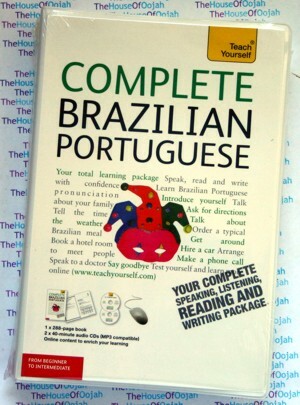 Whether you are starting from scratch, or are just out of practice, Complete Brazilian Portuguese will guarantee success! Now fully updated to make your language learning experience fun and interactive. You can still rely on the benefits of a top language teacher and our years of teaching experience, but now with added learning features within the course and online. The course is structured in thematic units and the emphasis is placed on communication, so that you effortlessly progress from introducing yourself and dealing with everyday situations, to using the phone and talking about work.By the end of this course, you will be at Level B2 of the Common European Framework for Languages: Can interact with a degree of fluency and spontaneity that makes regular interaction with native speakers quite possible without strain for either party. Is there a chemist's around here? Do you have a room free? Why don't we go to the theatre? Sue Tyson-Ward is currently a part-time lecturer in Spanish and Portuguese at Lancaster Adult College and Chair of ALL Spanish and Portuguese Committee. She has extensive experience of teaching, examining and writing. Brazilian Portuguese is a group of dialects of Portuguese written and spoken by virtually all the 184 million inhabitants of Brazil and by a couple of million Brazilian emigrants, mainly in the United States, United Kingdom, Portugal, Canada, Japan, and Paraguay. The differences between European Portuguese and standard Brazilian Portuguese are comparable to those one might find when comparing British and American English. The Brazilian formal written standard, which is defined by law and international agreements with other Portuguese-speaking countries, is actually very similar to the European one; but there are nevertheless many differences in spelling, lexicon, and grammar. European and Brazilian writers also have markedly different preferences when choosing between supposedly equivalent words or constructs. Nevertheless, the cultural prestige and strong government support accorded to the written standard has maintained the unity of the language over the whole of Brazil and ensured that all regional varieties remain fully intelligible. Starting in the 1960s, the nationwide dominance of TV networks based in the southeast (Rio de Janeiro and São Paulo) has made the dialects of that region into an unofficial standard for the spoken language as well. The existence of Portuguese in Brazil is a legacy of Portuguese colonization of the Americas. The first wave of Portuguese-speaking immigrants settled in Brazil in the 16th century, yet the language was not widely used then. For a time Portuguese coexisted with Língua Geral, a lingua franca based on Amerindian languages that was used by the Jesuit missionaries; as well as with various African languages spoken by the hundreds of thousands of slaves brought to the country between the 17th and 19th centuries. By the end of the 18th century, however, Portuguese had affirmed itself as the national language. Under the Marquis of Pombal administration, Brazil started to use only Portuguese, for he prohibited the use of Nhengatu, or Lingua Franca. The aborted colonization attempts by the French in Rio de Janeiro in the 16th century and the Dutch in the Northeast in the 17th century had negligible effect on Portuguese. Even the substantial non-Portuguese-speaking immigration waves of the late 19th and early 20th century — mostly from Italy, Spain, Germany, Japan, and Lebanon — were linguistically integrated into the Portuguese-speaking majority within a couple of generations, except for some areas of the three southern states (in the case of Germans and Italians) and rural corners of São Paulo (Japanese). The evolution of Brazilian Portuguese has certainly been influenced by the languages it supplanted: first the Amerindian tongues of the natives, then the various African languages brought by the slaves, and finally the speeches of the European and Asian immigrants. The influence is clearly detected in the Brazilian lexicon, which today is full of words of Tupi-guarani and Yoruba origin, among others. From South America, words deriving from the Tupi-Guarani family of languages are particularly prevalent in place names (Itaquaquecetuba, Pindamonhangaba, Caruaru, Ipanema). The native languages contributed the names for most of the plants and animals found in Brazil, such as arara ("macaw"), jacaré ("South American alligator"), tucano ("toucan"), mandioca ("manioc"), pipoca ("popcorn"), abacaxi ("pineapple"), and many more. Many of these words entered the Brazilian Portuguese lexicon in the 16th century, and some of them were eventually borrowed by European Portuguese and later even into other European languages. The African languages provided many words too, especially related to food, such as quindim, acarajé, moqueca; and household concepts, such as cafuné ("caress on the head"), curinga ("joker card"), and caçula ("youngest child"). Capoeira, marimba, and samba are also African (Bantu) words borrowed by Brazilian Portuguese that gained popularity, and these were also gained by European Portuguese and English. There are also many borrowings from other European languages such as English (especially words connected to technology and finance), French (food, furniture, and luxurious fabrics and concepts), German and Italian, and, to a lesser extent, Asian languages such as Japanese. The latter borrowings are also mostly related to food and drinks or culture-bound concepts, such as ‘’quimono’’, from Japanese kimono. The influence of these languages in the phonology and grammar of Brazilian Portuguese have been minor. Also, it is claimed that the virtual disappearance of certain verb inflections in Brazil, such as the past pluperfect and second person plural, and the Brazilian's marked preference for compound tenses, recall the grammatical simplification that is observed in the formation of pidgins. However, the same or similar processes can be verified in the European variant. Regardless of these borrowings, it must be kept in mind that Brazilian Portuguese is not a Portuguese creole, since both grammar and vocabulary remain real Portuguese. The written language taught in Brazilian schools has historically been based on the standard of Portugal, and Portuguese writers have often been regarded as models by Brazilian authors and teachers. Nonetheless, this closeness and aspiration to unity was in the 20th century severely weakened by nationalist movements in literature and the arts, which awakened in many Brazilians the desire of a true national writing uninfluenced by standards in Portugal. Later on, agreements were made as to preserve at least the orthographical unity throughout the Portuguese-speaking world, including the African and Asian variants of the language (which are typically more similar to EP, due to a portuguese presence lasting into the end of the 20th century). On the other hand, the spoken language suffered none of the constraints that applied to the written language. Brazilians, when concerned with pronunciation, look up to what is considered the national standard variety, and never the European one. Moreover, Brazilians in general have had very little exposure to European speech, even after the advent of radio, TV, and movies. The language spoken in Brazil has evolved largely independently of that spoken in Portugal.